I heard about this film long time ago but I did not get any chance to watch it. Enemy at the Gates is not yet another film but there is a real story behind it. Title of the film is taken from the book which was written by William Craig in 1973.It is a nonfiction book named “Enemy at the Gates”. The story in the film was taken place between 1942-1943 during the battle of Stalingrad in World War II. It was between the Germen Nazi and the Soviet Red Army. 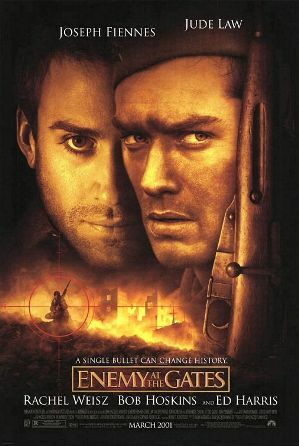 When I was watching this, I felt that the battle was not between the two countries between Vasily Zaitsev and Major Konig rather.Vasily was a hero for Soviet army and was a good sniper. At the end of the film there is a special note running and it says that with the order of Lenin Vasily Zaitsev later elevated to rank of Hero of the Soviet Union. Also his rifle can be seen at the Stalingrad History Museum. Running time of this movie is 131 minutes much longer than usual. It created as by directing of Jean-Jacques Annaud and co-written of Jean-Jacques Annaud and Alain Godard. Jude Law (Vassili Zaitsev), Ed Harris (Major Konig), Rachel Weisz (Tania Chernova), Gabriel Thomson (Sacha Filipov) are some cast of Enemy at the Gates. දොස්තර රිචඩ් ලයනල් ස්පිට්ල් විසින් රචිත සුදු ගෝනා කෘතිය මම කිහිපවරක්ම කියවා ඇත්තෙමි.හෑන්ස් නැමති ඕලන්ද ජාතික තරුණයා ඇසුරින් නිර්මාණය වී ඇති මෙය රසවත් මෙන්ම ත්රා සජනක සිද්දීන් තුලින් හැඩ ගැන්වී තිබේ.ඕලන්දයෙන් නැව් නගින හෑන්ස්ගේ නැව් ජීවිතය නිමාවෙන්නේ ලංකාව අසල මුහුදේදී ඔහු ගමන් කල නැව මුහුදුබත් වීම නිසාවෙනි.පසුව වැද්දන් හා එකතු වන හෑන්ස් ඔවුන් සමග ජීවත් වීමට පටන් ගනී.රුදුරු වන සතුන් සමග ඉතාමත් කුලුපග වෙයි.”දීයා,දිකුද්,බිම්බි,ටිකී” ඔහුගේ මිත්රෙ සිවුපාවුන්ය.”රන්දුනා,පෙමා,රනී,සෙලා,ගැස්පා,පිගේරා,රජතුමා මෙහි ඉන්නා වූ සෙසු චරිතයන්ය.ඒ.පී ගුනරත්නයන් විසින් සිංහලට පරිවර්තනය කරන ලද මෙම කෘතිය ඉතාමත් විශිෂ්ඨ ලෙස සිංහලට පෙරලා ඇත.ඒ බව මෙම පොතේ කතුවරයා ගැන හැදින්වීමේදීද විශේෂයෙන් සදහන් කර ඇත.